No wonder I’m tired. I’ve walked something on the order of 30 miles in the past four days. I failed to buy new walking shoes, because the place where I get ‘em wasn’t having a sale. I hope they do soon, because I’ve really already worn the two pair I have out. But I did stop into a not-so-much-walking-shoe store and admired how the pair of shoes that instantly caught my eye were the most expensive ones available. I’ve a real knack for doing that, so I do. 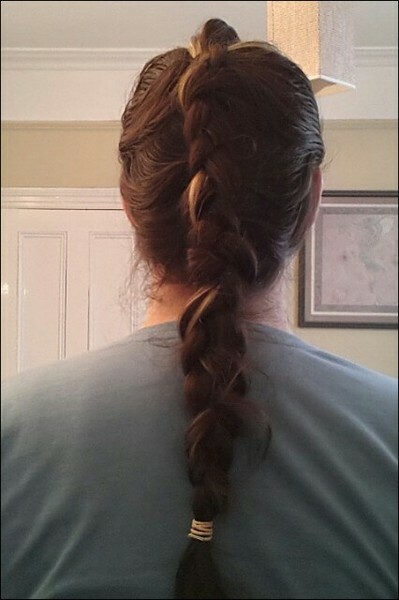 Apparently it’s called a Dutch braid, and it’s what happens if you braid under, rather than over, which is how I always braid my hair. I didn’t really *know* it was how I did it, or rather, that it wasn’t how everybody does it, although I always had the vague sensation that the tops of my braids, at the scalp, didn’t look like other people’s. Now I know why. That picture also happens to demonstrate nicely how, how in one’s imagination, braiding a Rogue stripe makes a big fat bright streak through the whole of one’s braid, but how in reality, well, this is what happens. And this is an unusually *good* showing of the bright streak: frequently it disappears entirely into the body of the braid. But ...you have lo-o-o-ng hair! Re: But ...you have lo-o-o-ng hair! My memories of doing it indicate that it's *very hard* to self-braid a streak where you can't see it and arrange the streak on the top, unless you can somehow isolate just streak to one braid, and it's probably not thick enough for that. You might be able to do it yourself with the help of a mirror but that's still a big challenge. Someone else braiding you could probably arrange the streak so it shows through the braid. You might be able to self-braid it by keeping the streak hair separate from the "bulk" hair for one strand of the braid, pulling in the bulk hair and then laying the streak strand on top of it. I've braided ribbons into my hair and it definitely did not look as I imagined or as fantasy art does! Later tries where I made sure to lay them on top went better, but braids are just fractious. That's a really interesting braid. Can't French-braid my hair for love nor money though, so I think the Dutch braid is definitely out. Pick up a pair of Norwegian Army M77 boots. Coarse-patterned sole of 'vibram' rubber cast directly onto the leather. If they're well-treated you an stand in a dam for 30 minutes before water seeps through.